Histories of the National Mall | What were the neighborhoods around the Mall like in the 1800s? The neighborhoods surrounding the Mall supported residents and workers as Washington grew into a city in the 1800s. Pennsylvania Avenue served as both a ceremonial path from the White House to Capitol and as a center for commercial activity. One of the first city markets stood halfway between the two iconic buildings. Early businesses in the city sprang up near the Capitol to serve members of Congress. As the century progressed, neighborhoods grew from a handful of stores to bustling commercial and residential areas after the Civil War when the federal government expanded. What was the neighborhood around the Mall like in the 1800s? One of the first markets in Washington City sat on the edge of the Mall. The Center Market opened in 1801 and vendors sold fruit, vegetables, and other foods. A low shed constructed in the 1820s covered market stalls until the 1870s, when a new multi-story brick building replaced it. This photo shows the later building, with delivery carts parked outside. In addition to the vendors inside the building, people sold goods from carts on the streets between the Market and the Mall. The Washington Canal, completed in 1815, connected the Potomac and Anacostia Rivers. 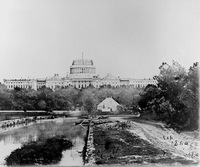 It ran where Constitution Avenue is today, crossing the Mall in front of the Capitol, as shown in this photograph. The Canal ran past Center Market and fishing wharves at the western end as it moved goods and food in and out of the city. People swam, boated, fished, and played in the Canal along along its route through the Mall. By the 1850s, canal barges delivered coal to businesses and homes in the area around the Mall. In the 1840s, residents of Washington, DC, petitioned Congress to establish a gas company in the city to power lights in houses, businesses, and on the streets. The Washington Gas Light Company opened in 1852, housed in a building on Maine and Maryland Avenues, where the National Museum of the American Indian stands today. It served the Capitol but also houses and businesses which stood next door, like the foundry and iron works down the block. The Gas Company tower, indicated with an arrow in the image, was a recognizable part of the skyline near the Mall for over fifty years. Restaurants and hotels dotted Pennsylvania Ave to serve congressmen and visitors to the city. 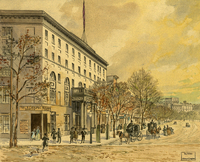 The National Hotel, seen in the foreground of this illustration from the 1860s, offered accommodations for tourists and housed congressmen during legislative sessions. Nearby stores sold cigars and pianos, and a laundry service catered to these customers. A park on the west side of the Capitol stands now where these businesses once thrived. 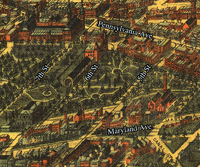 This birds-eye view shows the bustling neighborhood that bordered the Mall in the 1880s. 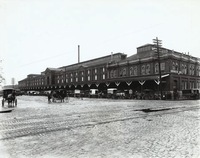 The railroad depot is on 6th Street, and Center Market appears at Pennsylvania and 7th Street. Washington Gas Works tower is shown at Maryland and 5th Street. Many small businesses and homes existed where museums and parkland are on today's Mall.